Most of the competitors on day one of the Flying Scotsman agreed that it had been a ‘marvellous’ day for motor sport. “Great weather, great roads and great competition, it was wonderful to be around the lakes this morning.” The words of Peter Lovett who along with navigator David Richards had been joint first in their 1937 Frazer Nash BMW 328 with Paul Crosby and Ali Procter in their 1939 MG TB Supercharged at the lunch halt. Lovett and Richards finished the day fourth whilst Crosby and Procter pulled away a little out front by the close. Many marveled at the site of the two Pioneer class cars running first and second on the road on Friday. The Dutch crew of Michel Laarman and Maryan Greif in the 1911 Knox R were amazing to watch as was the incredible seven litre Itala driven by David Ayre who was actually wearing a 1918 Beaver skin First World War flying cap along with a huge trench coat to ward off the elements. He and navigator Iain Wilson were the second car to arrive at Slaley Hall after they left Windemere as first car at 7.46 this morning. “It was a great day, no rain, no snow, we even had some sunshine. It was marvellous, the roads were outrageous! The only problem was getting slightly lost when two pages got stuck together on the road book, but Iain has done brilliantly considering it’s his first event” said David. After poor Tony Brooks broke his ankle yesterday, skidding off a hammer on the tarmac, another top navigator, Andrew Duerden was drafted in at the last minute to sit alongside American Jim Gately in the mighty 1937 Cadillac convertible.” I got the call at 4.00pm Thursday , said Andrew, “ I literally left immediately although my bag was still only half unpacked from the HERO Three Legs of Mann event. The Anglo American crew who’d been thrown together at the last minute finished a highly creditable 16th at the end of Friday in the unlikely rally car, the huge 1937 Cadillac. Jim was asked how he managed to get big wide car down some of the lanes? The first two tests of the day were at Holker Hall where the Frazer Nash TT replica of Theo Hunt and James Galliver showed they meant sideways business as they tail ended the little car around the markers. By the time they gyrated the car from lock to lock at the Rowrah Kart track, where Lewis Hamilton raced karts on his way to the top, navigator James Galliver looked as if he was about to fall out of the car! The ended day one in a spectacular 12th place. The same high speed control was demonstrated by Clint and Brad Smith in the fleet MG KN with it’s megaphone exhaust and engine sound so sharp that it could have cut the tarmac they were torturing at the Cumbria Kart Racing Club. A really stunning performance from the crew put them in third place on Friday night, just behind Bill Cleyndert and Leigh Powley in the spindly 1928 Ford Model A.
Alan Beardshaw and Peter Fletcher suffered from a misfire for most of the day with their 1934 Aston Martin Ulster. They too needed a plug change at the lunch halt but later revealed that the car preparation expert who looks after Alan’s car was making a three hundred mile journey on Friday night to try and fix the problem. German husband and wife team, Wilfried and Sandra Schaefer suffered a little stall off the line at the kart track test in their 1934 Talbot105 Alpine but soon got back into motion. Wilfried later revealed, “ We have been waiting for the engine to be rebuilt for nearly a year, we got it back just last week with no time to test. Then we got held up like everyone else because of the road blockage in Windemere, so today was it’s first test!” The duo were 17th at close of play Friday. Thomas Maechler and Andrea Scherz from Switzerland both looked menacing in the black Aston Martin Ulster as they wore their black all weather gear in the low slung open cockpit car. To top it off the pair wore black cork crash helmets like the police of yesteryear used to wear. “ I only use a crash helmet as my wife insists I do, otherwise no rallying!” Said Thomas. Three hours later the car drowned out in a deep fast running ford, the whole car obliterated by smoke and water. As the ERA assistance team backed up their truck ready to tow him out, the Aston Martin fired up again! Thomas and Andrea finished the day in 14th position. John added; “ I felt much better earlier in the week so put Pete out of his misery, but what a great day today, although that ford was a little bit too deep!” The other team Riley cars being run by John on the Flying Scotsman are all doing well. Stephen Owens and Nick Cooper in the 1937 Jaguar SS100 were mystified by a misfire on the way out the first two tests at Holker Hall. “Suddenly the whole lot cleared and we ran sweet again all day” Said Nick who navigated Stephen Owens to an impressive 20th overall at the end of Friday. The two Peters in car 22, Kappeler from Switzerland and navigator Horsburgh from Scotland were keeping a little score going between them in the 1928 Chrysler 72. “ I have made a few navigational errors, whilst he has made a few driving errors!” said Peter. “Its two apiece” said Peter Kappeler smiling, as they left the lunch halt later than they wanted after attending to their brakes. Hugh Apthorpe and Graeme Brown were really pleased with how well the day had gone in their 1929 Bentley four and a half litre, just before they pulled out of the Heritage Steam Locomotive yard at Alston. An appropriate venue for the Flying Scotsman to have a time control. Pulling in the envious looks where ever they went on Friday were the Dutch husband and wife team of Hank and Nicole Melse in their brightly coloured 1936 Alvis Speed 25. They both wore identical Mike Hawthorne style skid lids with visors but the best is the back of the Alvis where Nicole’s beautiful luggage cases are strapped. Not that the fancy luggage slowed them down at all, they ended Friday in 13th. 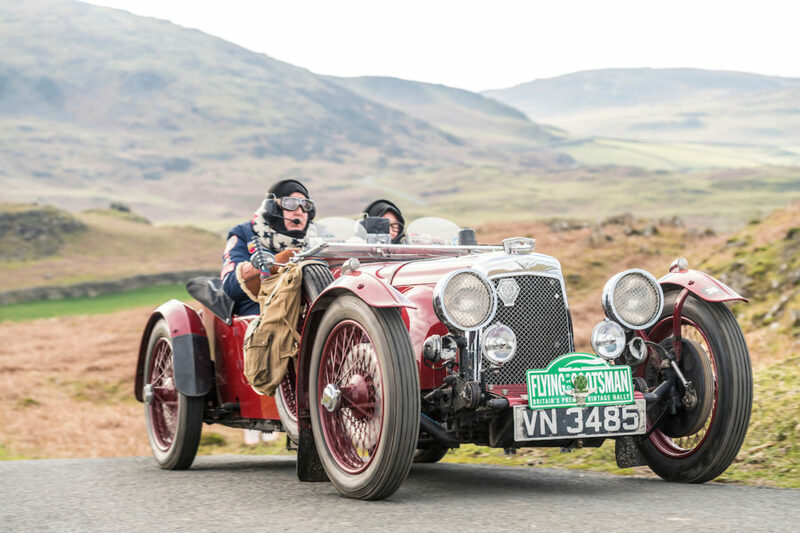 When the Melse team plus the rest of the Flying Scotsman competitors crested the long hill up to 1903 ft high to Hartside Summit, many spectators who had gathered to see the vast array of vintage cars in action, cheered, waved and clapped. Sometimes the crowd received a nice bullhorn back!